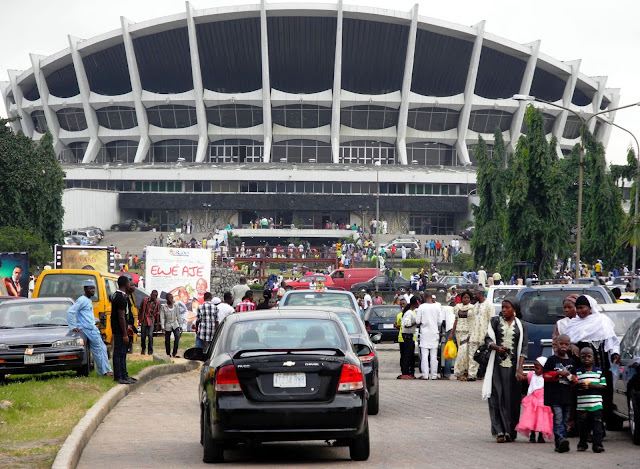 As throngs of people celebrated Christmas at the National Theatre,Iganmu,Lagos ,Suspected hoodlums on Friday invaded the premises,disrupting the peace of fun seekers . According to the News Agency of Nigeria (NAN),many people who had come to the premises to spend the Christmas day lost their valuables during the incident which occurred between 4.30 p.m. and 5 p.m. The venue suddenly became chaotic as members of the public, who had come for relaxation and sightseeing took to their heels following the activities of the suspected hoodlums. But the Police at the National Theatre Post eventually apprehended some of the suspected hoodlums. Mr Philip Patrick, a 19-year-old student, told NAN that he just saw people running all over the premises of the theatre. Patrick said that there were many pickpockets around. “There are also a lot of pickpockets around harassing fun seekers. “One of them took my camera but returned it immediately when I saw his hand coming out from my pocket. “I also saw the same man take items from other people,’’ Patrick said. Mrs Anabel Gbenro, a teacher, said that the incident was terrifying. “I have come here with my family to give them a tour of a historic place in our country.“The next thing we saw was people running to different directions. “It is annoying that hoodlums are roaming everywhere here taking items from innocent people who are trying to relax their nerves. “The security should be tighter; the police should increase their surveillance,’’ Gbenro said. Miss Precious Ukawuike, another fun seeker, said that more should be done to restore the glory of the theatre. “We cannot even go inside the theater; on a day like this, we cannot go inside to see how it is. “It is sad that a lot of our young generation, especially those living outside Lagos do not know what the National Theatre is. “I also think that people with demeanor which are visibly questionableshould be further scrutinised by security agents to prevent them from harassing harmless citizens,’’ Ukawuike said.